The Big Splash concert series is headed to the Seneca Lake Wine Trail! 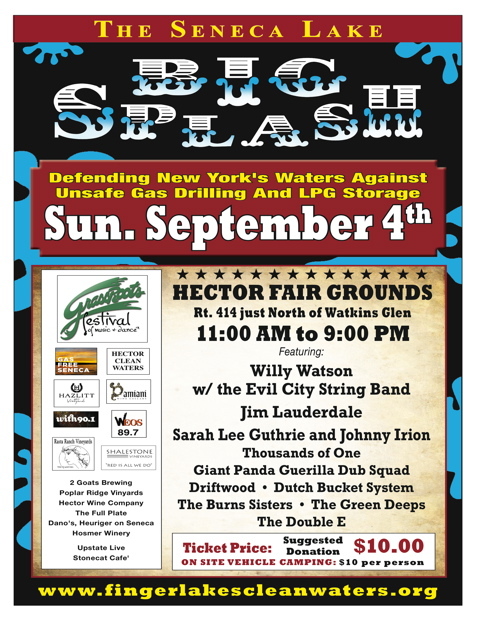 On Sunday, September 4th we will be bringing the Finger Lakes GrassRoots Festival Dance Tent to the Hector Fairgrounds to protect New York State waters and businesses from dangerous natural gas drilling. Seneca Lake is literally under pressure from both Shale Gas Fracking and Inergy’s proposed expansion of LPG Storage at Salt Point in the Town of Reading. We believe that our Wine and Tourism Industries are far to important to the Health and Well Being of the region to jeapordize. Educational Speakers join with musicians on Sunday Sept. 4 at the Seneca Lake Big Splash! Music schedule is further below. Please come out and help us celebrate and protect our Number One Economic Resource, Clean Water! Poster Art pdf’s and jpegs available under our Resourses pull down menu above. 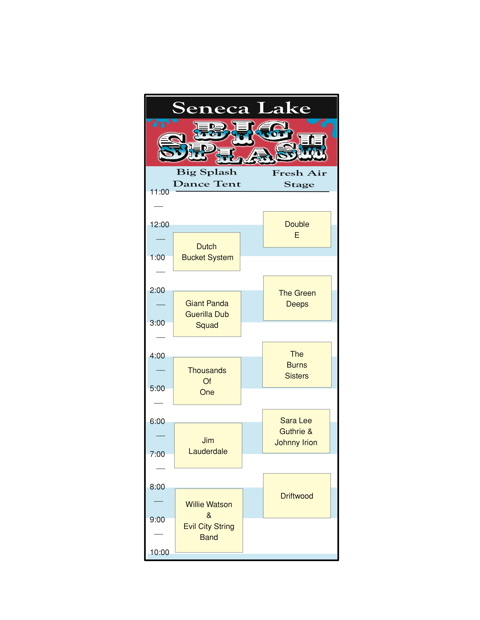 Fan our event page Seneca Lake Big Splash and get the latest news! two time Grammy winner Jim Lauderdale, Thousands of One, Sarah Lee Guthrie and Johnny Irion, Giant Panda Guerilla Dub Squad, Driftwood, Dutch Bucket System,The Burns Sisters, The Green Deeps and The Double E.The cost of the event is a $10.00 Suggested Donation. This awareness event is sponsored by the Finger Lakes GrassRoots Festival of Music and Dance, Hazlitt Winery, Damiani Winery,The Rasta Ranch, Sheldrake Point Vineyard and Bistro, Ithaca Beer, 2 Goats Brewing, Hector Wine Company,Poplar Ridge Vineyards, The Full Plate Farm CSA, Dano’s Heuriger on Seneca, Shalestone Winery, Stonecat Cafe’, Gas Free Seneca, Hector Clean Waters, Frack Action, NYRAD, Back to Democracy, Upstate Live, and Brewers Sanitary. On site vechile camping will be available for $10 a person! Camping will also be available on Saturday Sept. 3rd for those of you who want to come enjoy the wine trail on the day before the show. Also, for those of you who have long distances to travel, this will allow you to come the night before and be fresh for the show in the morning! No reservations needed, simply show up and pay at the event. A big thanks to Hazlitt Vineyards for allowing us to use their land! Fan our event page Seneca Lake Big Splash and get the latest news!